View of “Sheida Soleimani: Civil Liberties,” 2016. Sheida Soleimani’s exhibition “Civil Liberties” expounds on the dearth of photographic traces as a consequence of unjust executions of women in Iran. To create the five photographs and three soft sculptures on view, Soleimani has gathered scant low-resolution documentation from the victims’ lives and then constructed elaborate sets in which their faces—sometimes solemn, sometimes weeping—are repeated across surreal, alarmingly colorful tributes: a high contrast with the lack of global media coverage of their deaths. These tableaux, populated by lumpy sculptures printed with the women’s faces, are photographed and presented as sleek, gorgeously sharp pigment prints mounted on acrylic. 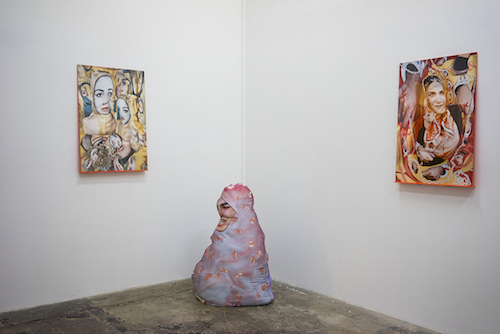 For instance, Shahla, 2016, shows a stuffed fabric doll printed with a woman, Shahla, in handcuffs; around her, cut red paper has been collaged with pixelated enlargements of her bound hands, and white plastic chains are draped into grim festoonery. Simple fabric dolls like those that figure in the images stand around the gallery, each drawn to the height of a kneeling adult. These elements are meant to reference Albert Bandura’s Bobo doll experiments in 1961, in which children acted violently toward dolls only after they were shown a video of a woman punching one. It could be that these sculptures need to quote the Bobo doll more precisely for the reference to be legible, but nevertheless, the slouching, physical pathos of the effigies Soleimani has sewn asks viewers to notice a learned apathy toward not only the disappeared Iranian women depicted but also women’s suffering more broadly. The darkly playful tone of the project seeks to celebrate women’s lives while indicting the circumstances of their deaths.